The US dollar has been under pressure, falling 8% between January 2017 and January 2018 alone. This weakening can be attributed to many factors, some related to President Trump and some less so. We had previously argued that the so-called “Trump slump” in the dollar was highly supportive of asset markets over the past year or more. As of this writing, some caution may be warranted regarding the strength of the US dollar, which had its biggest monthly gain in two years in April 2018. Regardless of whether this turns into a full-blown rally, an important question for investors may be: Will higher rate differentials and consequent hedge costs prompt a longer-term rally in the US dollar, damaging other asset markets and ending the “Trump dollar slump”? Source: Federal Reserve Bank of St. Louis. Trade-Weighted US Dollar Index (Broad), January 1997 = 100, weekly observations, not seasonally adjusted. Data from May 6, 2015, through April 25, 2018. To clarify, the phrase “Trump dollar slump” is not meant to suggest that President Trump is an existential threat to the dollar. While some may argue that the Trump administration’s somewhat mixed messages on the dollar, as well as political uncertainties on aspects such as trade, may have helped contribute to dollar weakness, many other factors have pressured the dollar or would have pressured it anyway. As discussed, without the negative dynamic of the dollar, it’s hard to see other assets performing as well as they did over the past year or more. Relatively high valuation from an academic standpoint, in addition to all the factors noted above. Source: Bloomberg, based on Citigroup Economic Surprise Indices. Data through May 7, 2018. The potential for recently enacted tax reform to prompt corporate repatriation into the US. This rate reconnection, in our opinion, may represent a clear and present danger, albeit a short-term one, to portfolios comprising many different types of assets. Consequently, we suggest investors assess where their risks lie within a spectrum of dollar strength and take necessary precautions to address those risks. Understanding foreign exchange (FX) risk and hedging costs is crucial to gauging those risks. For now, markets may be hitting the pause button on the virtuous cycle of dollar weakness that supported asset prices globally. 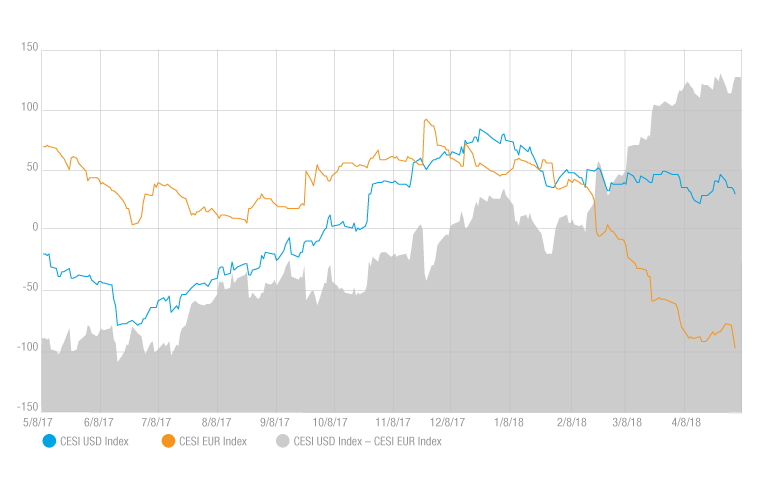 Higher yields in the US driving up hedging costs, coupled with US dollar strength, may be a bridge too far for risk markets at a time when investors are currently wondering about the overall strength of global growth, market volatility, and liquidity withdrawal through central bank actions. Despite these forces reasserting themselves, we see them as temporary, as we don’t think the series of unfortunate events for the US dollar are going away any time soon. We do believe the chances for the dollar to continue to reconnect with yields are tangible over the coming months. This risk is even more real when one takes into account that market sentiment and positioning regarding the US dollar were already overwhelmingly bearish given the long list of negatives facing the dollar. Prior to the US dollar moves over the past several weeks, asset markets were able to tolerate rates rising for “the right reasons” — in this case, those included robust global growth and low volatility in asset markets. Notably, except for brief periods of panic in the first quarter of 2018, markets were not all that concerned about rising US rates (for the right reasons) because the dollar was relatively weak, which is somewhat typical during the recent past in global expansions. However, with recent softer growth in Europe and with odds for other central bank normalization falling by the wayside, there is a chance that the US dollar continues to reconnect with the substantially higher yields in the US relative to the rest of the developed world, while at the same time starting to reverse a virtuous cycle for asset markets, driven in part by dollar weakness. While this may be temporary, it could be quite painful from a mark-to-market perspective for investors over the short term. Looking at currency markets longer term, even if global growth fades, we believe the US dollar will find it difficult to gain longer-term footing given the series of unfortunate pressures it continues to face. Those pressures may only become more pronounced as we progress through the year. Additionally, two other forces — which, ironically, are driven by US dollar strength itself and higher rates in the US — may ultimately limit the US dollar on the upside. If dollar strength persists, asset markets are likely to come under pressure, and that asset market pressure will likely spill over into consumer confidence and the real economy at large. This may temper the Fed’s rate hike path. Taking another view and path, if things are good enough for the US to continue to hike without negative feedback into the global economy, it is likely that other central banks will start to normalize interest rates as well. With expectations for normalization and rate hikes by other central banks far lower than the expected US rate hike trajectory, this convergence of expectations would ultimately pressure the dollar, while all the other unfortunate negative forces for the US dollar remain intact. Caution may be warranted in the near term for asset markets as the US dollar could enjoy further support stemming from higher hedging costs and attractive interest rate differentials versus its trading partners. We would temper this by saying that, longer term, exposures outside one’s home currency do represent a tangible source of diversification. Shorter term, we may find that the US dollar is in the risk market driver seat, and adding foreign holdings to a portfolio may exacerbate the overall pain felt in asset markets. We therefore believe it is key for investors to understand the factors affecting currencies and the best means of hedging against downside risks. Hedging forex (FX) exposure, while still fostering a degree of FX exposure outside the home currency, not only can be beneficial from a diversification perspective but has the potential to enhance returns while lowering portfolio risk. Overall, we see few reasons for sustained US dollar strength. Further, if the US dollar continues to rally from here, it is likely that the strength itself becomes its own undoing as risk markets adjust. We believe short of the recent “US economic exceptionalism” relative to the globe becoming a more entrenched, longer-term phenomenon, the dollar will remain pressured over the medium term. 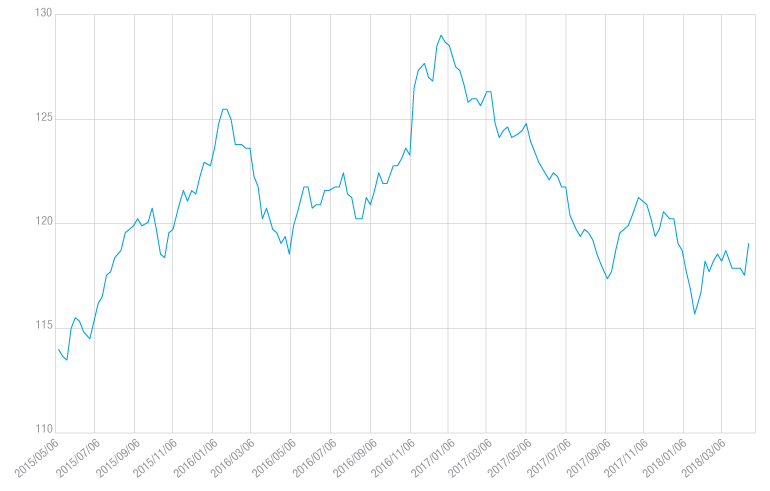 We would, however, suggest a heightened awareness surrounding exposures to US dollar strength over the near term. The views expressed represent the Manager's assessment of the market environment as of June 2018, and should not be considered a recommendation to buy, hold, or sell any security, and should not be relied on as research or investment advice. Views are subject to change without notice and may not reflect the Manager's views. Currency risk is the risk that fluctuations in exchange rates between the US dollar and foreign currencies and between various foreign currencies may cause the value of an investment to decline. The market for some (or all) currencies may from time to time have low trading volume and become illiquid, which may prevent a fund from effecting positions or from promptly liquidating unfavorable positions in such markets, thus subjecting the fund to substantial losses. Forex (FX) is the market in which currencies around the globe are traded. The Trade Weighted US Dollar Index (Broad) represents the weighted average of the foreign exchange value of the US dollar against the currencies of a broad group of major US trading partners. The index includes currencies for the Euro Area, Canada, Japan, Mexico, China, United Kingdom, Taiwan, Korea, Singapore, Hong Kong, Malaysia, Brazil, Switzerland, Thailand, the Philippines, Australia, Indonesia, India, Israel, Saudi Arabia, Russia, Sweden, Argentina, Venezuela, Chile, and Colombia. The Trade Weighted US Dollar Index (Major Currencies) represents the weighted average of the foreign exchange value of the US dollar against a subset of currencies that circulate widely outside the country of issue. Major currencies represented in the index include those for the Euro Area, Canada, Japan, United Kingdom, Switzerland, Australia, and Sweden. The Citigroup Economic Surprise Indices are 3-month rolling measures of actual economic surprises relative to market expectations. A positive reading means that data have been stronger than expected, while a negative reading means that economic data have been weaker than expected. An index is unmanaged and one cannot invest directly in an index. All charts are for illustrative purposes only. Certain sourced materials may have been used as the basis for the charts or graphs reflected herein. Is the "reflation bias" getting less biased?